Polish author of the seventeenth century; went to Vienna, and, on the expulsion of the Jews from that city in 1670, went to Brest, Lithuania, where he married a daughter of Elijah Lipschütz. He was the author of "'Asarah Maamarot" (Ten Words), a work treating of the ten divine words which, according to Pirḳe Abot (v. 1), were used in the creation of the world; also of the Decalogue, published in 1680 at Hamburg or Frankfort-on-the-Oder. In 1685 he published "Zera' Abraham" (Abraham's Seed), on the connection of the weekly lessons in their Pentateuchal order. 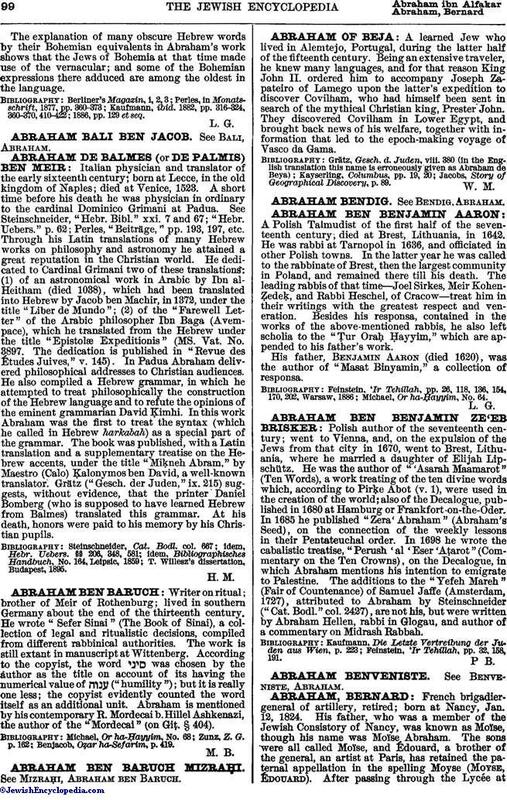 In 1698 he wrote the cabalistic treatise, "Perush 'al 'Eser'Aṭarot" (Commentary on the Ten Crowns), on the Decalogue, in which Abraham mentions his intention to emigrate to Palestine. The additions to the "Yefeh Mareh" (Fair of Countenance) of Samuel Jaffe (Amsterdam, 1727), attributed to Abraham by Steinschneider ("Cat. Bodl." col. 2427), are not his, but were written by Abraham Hellen, rabbi in Glogau, and author of a commentary on Midrash Rabbah. Feinstein, 'Ir Tehillah, pp. 32, 158, 191.